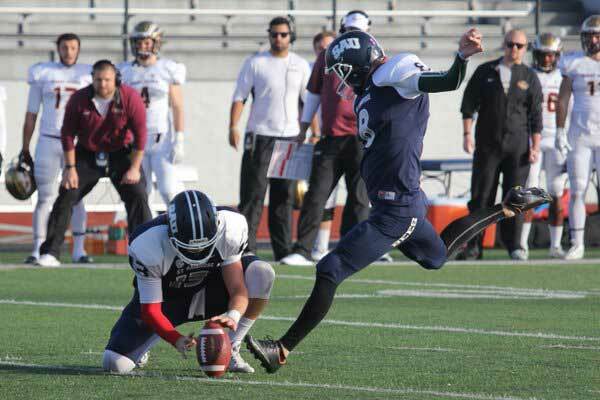 St. Ambrose University senior place-kicker Matt Cotiguala (Orland Park, IL) is the recipient of the 2015 Fred Mitchell Award. The Award is provided to the nation’s top place-kicker in FCS, Division II, Division III, NAIA and NJCAA for excellence on the football field and in the community. Over 750 place-kickers are eligible. Cotiguala was 23-of-25 on field goals in the 2015 season, going 5-of-6 from 40-plus. He was a perfect 28-of-28 on his point after attempts. ssisted veterans, volunteered for the Special Olympics, served in area soup kitchens and helped develop local high school kickers. 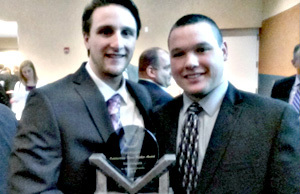 Matt Cotiguala of St. Ambrose University receives the 2015 Fred Mitchell Award during the annual National Football Foundation ceremony at Halas Hall in Lake Forest, Illinois. 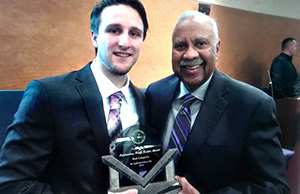 Matt Cotiguala (left) poses with two-time former Fred Mitchell Award winner Tom Lynch from Saint Xavier University. The annual Fred Mitchell Outstanding Place-Kicker Award (also known as the Fred Mitchell Award) is provided to the nation’s top collegiate place-kicker among more than 750 FCS, Division II, III, NAIA and NJCAA football teams.